Users leaving? Microsoft Edge is something that the Redmond based technology giant pushes really hard in order to convince users to give the new browser a try. But it seems that all these efforts are not exactly paying off for Microsoft. Statistics provided by NetMarketShare for the month of November show that the default Windows 10 web browser is far behind its rivals. And is actually going in reverse, when it comes to evolving its market share. Microsoft Edge, at this point, is listed with a share of 5.21%, making it the fourth most used web browser in the world. Internet Explorer is still ahead of it, as are rivals like Mozilla Firefox and Google Chrome. Only browsers behind Edge are Safari with 3.61% and Opera with 1.36%. However, the interesting fact is that Edge actually dropped to this share from the 5.26% it recorded in November. And this is quite unexpected, considering the heavy push it gets from Microsoft. Plus, the various little features it has added into the solution in the recent months. One major factor that is holding Edge back, resulting in this limited adoption, is that it is exclusively available on Windows 10, with no plans from Microsoft to release it on other platforms. Though it seems like this may change in the future. At the same time, all other rivals, and even IE can be used on all versions of Windows. 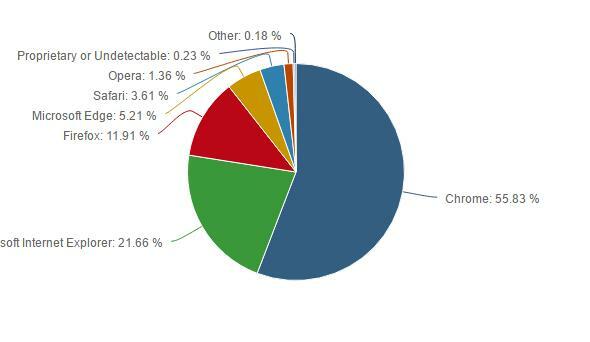 For the record, Chrome is doing a lot better, now running on 55.83% of PCs across the world, Internet Explorer is now at 21.66%, followed by Firefox with 11.91%. If Edge would be available on other Windows OSs we would see a triple market share. But, let’s be honest, right now, Edge is not one of the best browsers out there. True all the way. Edge is being pushed hard by Microsoft but it doesn’t deliver on many fronts. I wonder what would happen if Microsoft invested as much effort, time and money into making Edge better as it spends on advertising it. I used Safari, Firefox, Opera and Chrome. Finally, I still pick Edge as my default web browser.